It’s becoming clear that the concept of “digital twins” will shape the future of how Internet of Things (IoT) applications are built. In fact, a Garter Research survey found that 48 percent of companies currently deploying IoT solutions are using, or have a strategy for using digital twins by the end of 2018. A digital twin is a virtual representation of a real world object, consisting of data from and other contextual information about that real world object. Digital twins can represent an industrial device, a vehicle, a person, or even a composite of multiple data sources, such as a traffic intersection. Multiple digital twins can be composed together to model complex real-world systems, while allowing developers to interact with a digital twins as proxies for individual devices. This simplifies application development as well as device management, for operations professionals. Digital twins provide a method for application developers to interact with individual nodes in a system in a simple, one-to-one way. Traditionally, changes to device logic may have required a physical update of the device’s firmware, a costly and labor-intensive process. Universal policy changes may have been administered from the cloud, but if each node in the system requires a unique set of logic, administration quickly becomes complex and difficult to maintain. However, digital twins, each node functions independently, and changes to an individual node will not (directly) affect the operation of other nodes. As each digital twin operates as an independent entity logically decoupled from the greater system, digital twin applications can accommodate extreme variation (amongst digital twins) without increasing overall application complexity. 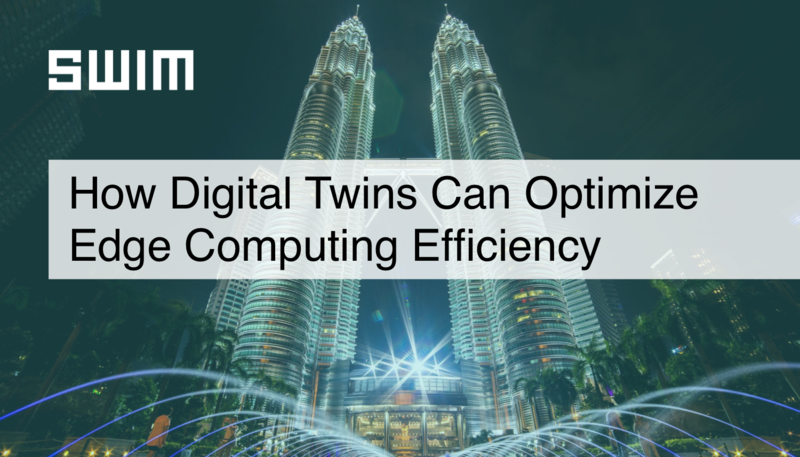 While simplified application development and management are helpful, the primary value of digital twins is that they can underlie significant efficiency gains. This is especially true when it comes to edge computing architectures. Edge computing delivers application logic to the edge, where streaming data data is generated. This makes it possible to filter streaming edge data before transmitting over a local network. But deciding which data to filter out can be a challenge, and filtering out the wrong data can lead to missed insights about critical events. When digital twins are deployed at the edge, contextual information is made available locally and can be used to intelligently filter streaming data. Digital twins can be “made aware” of upstream or downstream devices, environmental information, historical behavior, or other status information which may be relevant to interpreting streaming data. Having this information available locally ensures that edge filtering algorithms are informed with any relevant context in real-time.